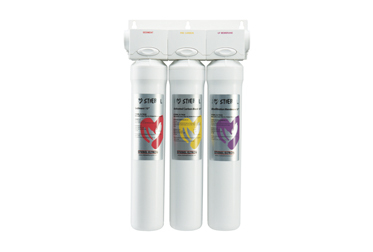 Our 3 stage water filtration system, as its name suggests, puts water through 3 different stages of filtration down to an amazing 0.01 micron. The system comes with everything you need to filter the water coming out of the tap in your home, including one of each of the cartridges (red sediment filter, yellow activated carbon block filter and purple ultra filtration filter), a tap, a non-return 350 kPa PLV, a tap fixing kit, plastic tubing and tube connectors. The compact filters take up very little space under the sink and are easy to install. You will be enjoying delicious, clean water in no time.